This is a collection that combines two of our techniques in one exciting collection. The first technique is our hand stitched single color embroidery, which combines hand drawn artwork, hand digitizing and 4 layers of thread for a bold look. The second technique is realistic shaded beetles that contain multiple layers of colors and thread blending. The end result is striking! The contrast of hand stitching with realism really makes the beetles pop off of the fabric. There are 20 different pieces of art featured in the collection and all of the designs come in multiple sizes. 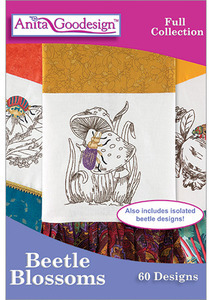 All of the beetles also come isolated without the background stitching so you can add them to any project you like.